Free Practice 2 for the Japanese Grand Prix was a rain-soaked affair during which the drenched spectators saw very little track action. Only five drivers even clocked a lap time, and Lewis Hamilton was the fastest overall. The lineup for the weekend was: Mercedes Lewis Hamilton and Valtteri Bottas; Red Bull TAG Heuer Daniel Ricciardo and Max Verstappen; Ferrari Sebastian Vettel and Kimi Raikkonen; Force India Mercedes Sergio Perez and Esteban Ocon; Williams Mercedes Felipe Massa and Lance Stroll; McLaren Honda Fernando Alonso and Stoffel Vandoorne; Renault Nico Hulkenberg and Jolyon Palmer; Toro Rosso Renault Pierre Gasly and Carlos Sainz; Haas Ferrari Romain Grosjean and Kevin Magnussen; Sauber Ferrari Marcus Ericsson and Pascal Wehrlein. Vettel went quickest in FP1, setting a 1:29.166 on the super soft Pirelli slicks. It had started to rain at the end of FP1 and continued to rain on and off during the break. And it was raining steadily as the kickoff time for FP2 approached. But there was no kickoff. "Start of second practice session delayed indefinitely due to track conditions," race officials stated. But as this was only practice, the clock started and began to click down the 90 minutes. So the fans got soaked while the team members and drivers stayed dry in the garages. The ambient temperature was 59 degrees Fahrenheit (15 degrees Centigrade) and the track temperature was 64 degrees Fahrenheit (18 degrees Centigrade). 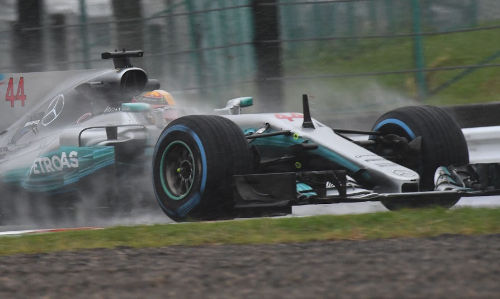 "It is even worse than it was 15 minutes ago," safety car driver Bernd Maylander said after doing a couple of laps in the Mercedes 15 minutes into the session. Officials eventually announced that FP2 would start 45 minutes late, so 45 minutes remained when the green lights came on. No drivers ventured out immediately, however. They had got in wet track work in Malaysia just a week before. Raikkonen did a solitary lap as did Hulkenberg, Palmer and a few others. All of course were on Pirelli's extreme wet rain tire with the blue sidewalls. Perez and Ocon did the first flying laps with Ocon fastest with a 1:49.518. Then, with 22 minutes remaining, Hamilton shaved 0.799 of a second off of that with a lap in 1:48.719. Stroll, good in the wet, went way off at Turn 1 but avoided the barriers. Another to go out was Sainz after the mechanics had repaired the car he's crashed in FP1. The final short order was: Hamilton, Ocon, Perez, Massa and Stroll.